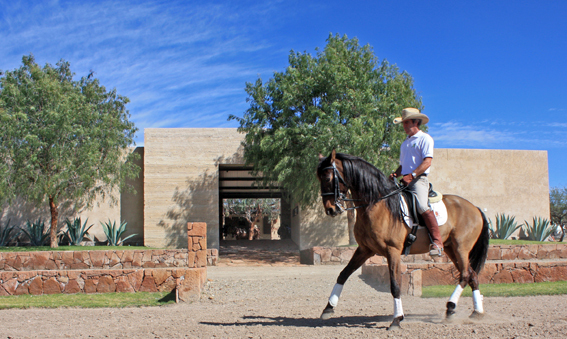 The Equestrian Center at Los Senderos is an important element to the overall philosophy of the development. Here you will discover the perfect place for private horse owners and trail riders alike. If a laid-back country lifestyle in an environmentally conscience equestrian-friendly community is what you are looking for, Valle de Los Senderos in San Miguel brings you the perfect place to call home. Los Senderos Equestrian center encompasses 10.4 hectares with 4.8 hectares of pastures and paddocks. The center has 9 indoor stalls, complete with resident horse-owners tack room with private lockers, a resident/guest lounge, covered terrace area, indoor feed and hay room, wash/grooming stalls and restrooms. The facilities also feature three separate indoor runs and multiple stalls with direct access to outdoor runs. Available exclusively to residents, all boarding is full-care, including daily grooming and blanketing. Small group or private turn out is available, training and exercise can also be provided. The riding areas include an outdoor arena an outdoor round pen and several miles of trails. Its director, Dr. Jeff Pendergraft, brings over 28 years of equine experience to Los Senderos. Whether you’re in San Miguel to spend the weekend, summer or even year-round, the quietness of nature totally surrounds you at Los Senderos. Here you will discover a simple oasis to enjoy with like-minded people whose greatest joy is a walk, jog or horseback ride through the trails, a picnic by the lagoon, or a casual dinner watching the sun set over the mountains. Horse lovers have specific requirements when searching for a place to live for themselves and their equine companion and the Equestrian Center at Los Senderos meets a wide variety of desires and needs. Horse ownership is not mandatory at Los Senderos – an assortment of well-trained horses will be available for lessons and trail rides. There will be a horse share program where members can lease a horse and enjoy many of the benefits of ownership for about half the cost. Valle de Los Senderos Equestrian Center is committed to maintaining a first-class equestrian amenity. In addition to programs tailored from beginners to the serious, lifelong riders, the center will continually be upgrading its equestrian facility. The climate in San Miguel de Allende is perfect for year round riding or training, only adding to the appeal of the equestrian-lifestyle at Los Senderos. The average temperature for the year is 65.8°F (18.8°C). The warmest month on average is May, with an average temperature of 72.0°F (22.2°C). The coolest month on average is January, with an average temperature of 58.1°F (14.5°C). The average amount of precipitation for the year in San Miguel de Allende is 22.2′ (563.9 mm).